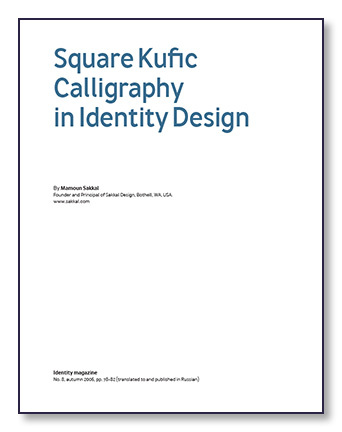 I present in this article a brief review of Square Kufic calligraphy and the Arabic script used in it, as well as a glimpse of the history of Arabic calligraphy and its main styles. Then, I explore in some detail why Square Kufic calligraphy is used more and more nowadays in identity design. Throughout, I will present a few examples of my work to illustrate many of the ideas and show a range of possible designs based on this remarkable style of calligraphy.